THE Department of Tourism (DOT) 7 recorded around eight million tourist arrivals for 2018. This is 16.13 percent higher compared to the recorded 6.9 million tourist arrivals in 2017. DOT 7 Director Shahlimar Hofer Tamano said they attributed this progress to the opening of additional ports of entries and intensified security measures in the region. “What do tourists look for? Aside from the beautiful destinations, they are also checking on the safety of the place. The opening of the Terminal 2 of the Mactan-Cebu International Airport (MCIA) and the inauguration of the new Panglao International Airport in 2018 have created additional flights and consequently caused the progress in the tourism industry.” he said. The Terminal 2 of the MCIA was opened in July while the new Panglao Airport in Bohol was inaugurated in the third week of November. Cebu Alliance of Tour Operations Specialists (Catos) president Alice Queblatin added that the increase of inter-island connections, the frequency of trips, and the promoted tour packages also enticed tourists to visit the region. “For those who enter Cebu, we know that the number one destination they go to is Oslob, Moalboal or Kawasan falls. They do all the activities there, and they also learn that they can cross over to Dumaguete, which is very efficient, only 30 minutes’ boat ride with very good ferries, and that they can also exit from Dumaguete back to Manila. That kind of route is very popular nowadays,” she said. On the other hand, the United Kingdom remained one of Central Visayas’ top tourist markets despite the 2018 travel advisory issued by its government. According to DOT 7’s records, visitors from the United Kingdom are the top seven in Central Visayas, with around 57,000 arrivals. This is 16.11 percent higher compared to the recorded 49,484 arrivals in 2017. “If only the British government did not release a travel advisory in 2018, maybe we could even reach 20 percent growth rate from our UK tourist market,” Tamano said. The British Government, in August 2018, issued a travel advisory warning its nationals from traveling to the central and western parts of Mindanao, including some parts of southern Cebu (particularly in Dalaguete and Badian) due to threats of terrorism. Korea (with 1.3 million visitors), China (with 621, 993 visitors) and Japan (with 464,564 visitors) were the region’s top three foreign tourist markets in 2018. “The temporary closure of Boracay for six months last year has somehow contributed to the boost of tourism in Central Visayas.” said Tamano. Cebu City, with an estimated 1.6 million domestic visitors, and Lapu-Lapu City, with an estimated 1.3 million foreign visitors, were the top destinations in the region, for domestic and foreign tourists, respectively. “Cebu City is known for its heritage sites such as the Fort San Pedro, Cathedral and Parian,” Queblatin said. 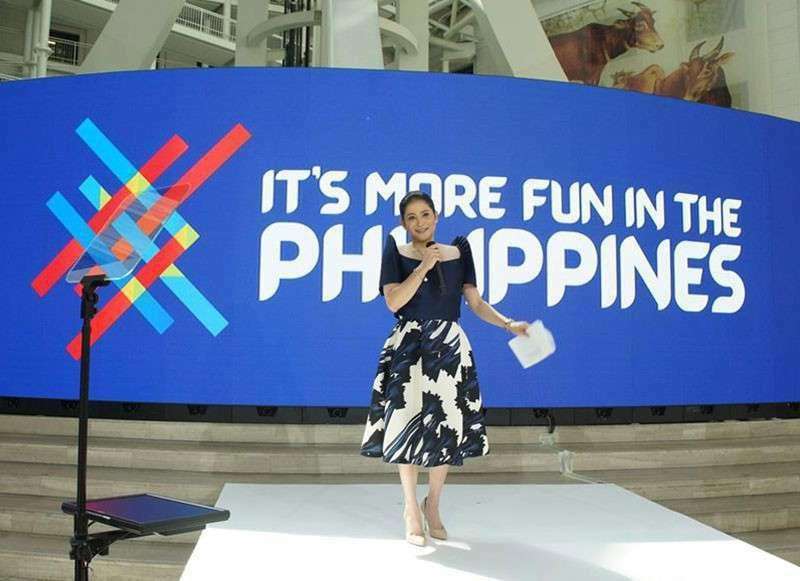 Meanwhile, the DOT launched a renewed and refreshed “It’s More Fun in the Philippines” campaign. Tourism Secretary Bernadette Romulo-Puyat, who spearheaded the launching held at the National Museum of Natural History, said the new campaign focuses on sustainable tourism in the wake of government’s cleanup efforts in Boracay and Manila Bay. “With more and more travelers conscious about their ecological footprint, the cultures and experiences they are consuming, and simply wanting to know how they can give back. The time is ripe for the repurposing of the word ‘fun’,” Romulo-Puyat said. The new campaign is 100-percent crowd-sourced as it uses some of the 4.3 million real photos, videos and reviews shared by both local and foreign travelers using the hashtag #ItsMoreFunInThePhilippines. “After all, working with what we already have is the essence of sustainability,” Romulo-Puyat said.